This is light and dark, the fanlisting for Star Wars: The Force. For me the force is the definition of Star Wars itself. Everything happens because of and with the force. 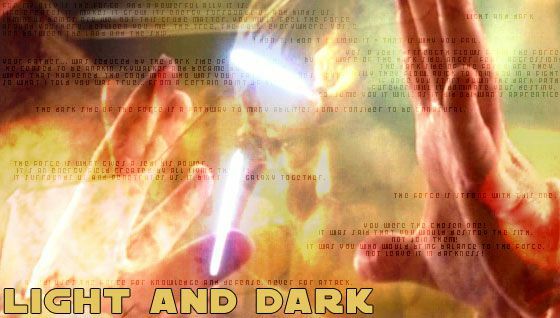 I chosed the name light and dark because of the light and dark side of the force - the fight between those sites it what the Star Wars movies are about. I tried to show light and dark as well in the layout - the contrasts between the background colors, the dark letters in the header...and I used the conflict between Obi-Wan Kenobi and Anakin in the end fight in Episode 3...the fight between light and dark...not only between Obi-Wan and Anakin, but as well IN Anakin. This fanlisting has a total count of 209 members + 0 pending. It was last updated April 15, 2019. The fanlisting was opened November 3, 2004 and is approved by thefanlistings.org. This fanlisting was made by Martina and is part of Inspirationally. So this is a place where all the people who really like Star Wars: The Force can submit their information to build the biggest listing. I am not affiliated with Star Wars: The Force or anything related in any way nor have I contact to them. This is a non profit site made by a fan for fans. All pictures, names, trademarks, etc. are copyright their original users and used under fair use - the layout copyright by me.